To the geranium lover every plant is viewed as a combination of esthetic characteristics. What is the flower color? Is the flower single or double? Are the flowers large or small? Are there lots of blooms? What do the leaves look like? Are they green or multicolored? Does the plant bloom anytime or just at a certain season? Is the plant short or tall? Does it grow upright or does it trail? Could it be a dwarf or miniature? These are some of the features that are of primary interest to most of us. Other aspects of the plant are of little or no concern to many of us. But to the botanist, every plant is viewed as a combination of an infinite number of characteristics. Every aspect of the plant is of potential interest. From the roots, to the stems, to the leaves, to the flowers, to the seeds, all of the parts of the plant may tell the botanist something else about the plant. Are the roots fibrous and delicate or thick and tuberous? Is the stem woody and perennial? Are the leaves smooth and shiny or rough and hairy? Are the flowers attractive to bees, flies or hummingbirds? Do the seeds germinate readily or do they need special treatment? The list of plant characteristics could go on and on. All characters of the plant, large and small, are considered fair game to the botanist. Let's look at just one special aspect of a Pelargonium plant. We have probably all been impres look at just one special aspect of a Pelargonium P. tomentosum, the peppermint scented geranium. Most of our common zonal geraniums have hairs on their stems, leaves and flower stalks and they may be smelly or sticky. The hairs on a plant are called trichomes by the botanist. The hairs or trichomes perform various functions which I will report on in another article. 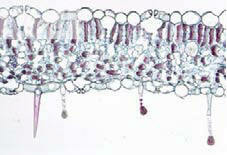 Various studies have been done at the microscopic level to learn more about the hairs/trichomes on Pelargonium plants. It was found that there are basically two different types of hairs present, namely glandular and non-glandular. The non-glandular hairs consist of a single, sharp-pointed plant cell projecting from the surface layer of cells (or epidermis) of the plant. The glandular trichomes have a spherical or ball-shaped or pear-shaped top. Researchers have found that the chemicals (essential oils) which give geraniums their particular odors (scents) are produced by the glandular hairs. It was also found that the scented oils are produced repeatedly by the glandular hairs ,not just once. All geraniums with scented leaves have glandular hairs. Apparently the non-glandular hairs do not produce any scented chemicals. Some of the unscented geraniums do produce glandular hairs, but these hairs do not produce any scented essential oils. In a future article, I will delve into other botanical aspects of Pelargonium as well as look at some of the essential oils which these plants produce.